This is the first card I am posting for the Die Cut Divas design team. I am so excited to be apart of the team!!! The challenge on the Blog this month is June Bug and the sponsor is Bugaboo stamps. 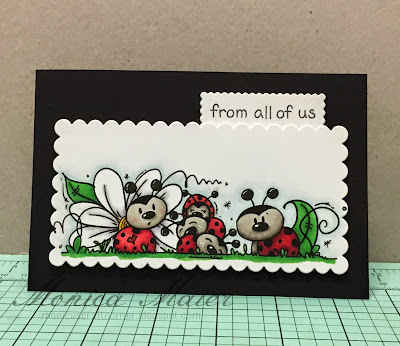 For my card I colored the ladybugs with copics and then cut them out with some dies before adding the panels to the card base. I keep it pretty simple so the ladybugs would take center stage! I love the way you colored their heads - they look like they're caught in the act of doing something they shouldn't be doing. Such a fun card. A delight.